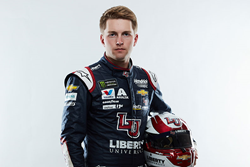 Liberty University student William Byron, driver of the Liberty University No. 24 Chevrolet Camaro ZL1, clinched NASCAR Cup Series Rookie of the Year honors with Sunday’s ninth-place finish at the Can-Am 500 in Phoenix. “Obviously, (winning Rookie of the Year) was our No. 1 goal, … and it’s awesome. It’s one step toward a bigger goal of winning races and championships." With that race, Byron, who is pursuing a degree in business communication through Liberty’s online program, earned his fourth Top-10 finish in his first season in the Cup Series, the highest level of NASCAR. Byron has now won Rookie of the Year honors in four consecutive seasons; he earned the award in the NASCAR Xfinity Series in 2017, the NASCAR Camping World Truck Series in 2016, and the K&N Pro Series East in 2015. Erik Jones (2015-17) is the only other driver to sweep Rookie of the Year honors in the Truck, Xfinity, and Cup Series in consecutive seasons. The 2018 season concludes on Sunday with the Ford EcoBoost 400 at Homestead-Miami Speedway in Florida, where Byron will be aiming for his fifth top-10 finish with hopes of moving up in the final points standings. Liberty will remain a primary sponsor for the No. 24 car team again in 2019 when seven-time Cup Series champion crew chief Chad Knaus will be on board. The season will open Feb. 10 with the Advance Auto Parts Clash at Daytona International Speedway, followed by the Daytona 500 the following Sunday. Read more about Byron and Liberty’s online program at Liberty.edu/24.